The 150 Recipes series is a must-have in your kitchen! Check out these simple, quick, home-cook Chicken recipes in this little book. If you are looking for new recipes to spice up your chicken routine then look no further and delve into these delicious recipes. This collection of 150 recipes gives you easy step-by-step instructions to make an amazing chicken dish. From quick and easy lunch recipes to more exotic dishes you are sure to find a recipe your heart desires. Why not try Chili Verde Chicken Stew or a delicious Smoked Chicken and Ham Focaccia? This is a great introduction to amazing chicken dishes. The 150 Recipes series is a must-have in your kitchen! Tapas is packed with 150 traditional and contemporary recipes from Patatas Bravas and Spanish Tortilla to Chorizo and Quail Egg Toasts and Artichoke and Pimiento Flatbread. The 150 Recipes series is a must-have in your kitchen! Check out these simple, quick, home-cook stir-fry recipes in this little book. If you are looking for new stir-fry recipes to spice up your routine then look no further and delve into these delicious recipes. 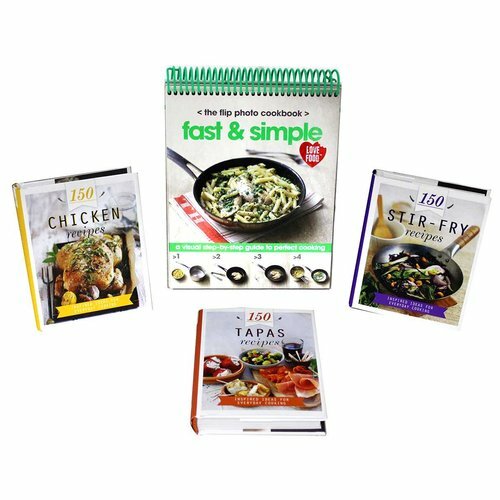 This collection of 150 recipes gives you easy step-by-step instructions to make an amazing stir-fry dish. From quick and easy appetizers to fuss-free family meals you are sure to find a recipe your heart desires. Why not try Korean Stir-Fried Beef or a delicious Ginger Chicken with Noodles? This is a great introduction to amazing stir-fry dishes. The perfect gift for any fan of home cooking. A visual step-by-step guide to mastering the art of cooking, with photography that allows for at-a-glance clarification of each recipe step. The contemporary design and stylish layout makes for a truly beautiful book.